Mason Rudolph – The Baltimore Ravens’ Jimmy Garoppolo? In 2014, the New England Patriots drafted Jimmy Garoppolo in the second round of the NFL Draft. The Patriots did not need a quarterback but wanted insurance on future Hall of Famer Tom Brady. The idea was to develop Garoppolo, so if Tom Brady was to retire, he would be able to fill in immediately and keep the Patriots competitive. The Ravens are in a similar situation now as the Patriots were in 2014. Quarterback Joe Flacco is aging, and with recent injuries, there’s no telling when he is going to leave football. Many have speculated on whether or not the Ravens would draft a quarterback this year. Even mock drafts by NFL analysts have suggested that the Ravens will look for a quarterback this year. Of all the earlier round quarterbacks, Mason Rudolph makes the most sense for the Ravens. He’s likely to be picked in the second round and is ready for the NFL. Rudolph was born to be an NFL quarterback. He stands at 6’5″, and weighs 235 lbs. Rudolph, unlike Josh Allen, is not just a physical specimen to NFL scouts. Rudolph has proved time and again to have the mentality of an NFL quarterback. He is smart and makes great decisions when throwing the ball, and his statistics reinforce this. In 2015, Rudolph threw for 3,770 yards, 21 touchdowns, and 9 interceptions. In 2016, he improved his numbers further, throwing for 4,091 yards, 28 touchdowns, and just 4 interceptions. During his senior year, arguably his best season, Rudolph threw for 4,904 yards, over 489 attempts, averaging for a staggering 10 yards per attempt. Rudolph also threw 37 touchdowns to 9 interceptions in 2017. One of the primary reasons Rudolph averages such high statistics is his cannon arm. Rudolph can launch the ball deep with ease, and he utilized his arm strength frequently throughout his collegiate career. To compliment his very strong arm, Rudolph is an accurate passer. To clarify, Rudolph delivers the ball to where the receiver is almost anywhere on the field. Accuracy is not the same thing as precision, however. Rudolph also has great pocket awareness and has the valuable ability to evade the pass rush. Rudolph has decent speed to help him do this. At the 2018 NFL Combine, Rudolph ran the 40-yard dash in 4.9 seconds. Finally, Mason Rudolph is tough. Rudolph will put everything on the line to help his team win. In 2016, Rudolph broke one of his ribs. Instead of sitting out, he played half the season with a broken rib, carrying his team to the Alamo Bowl. Mason Rudolph is nothing short of a great quarterback, but like all great players, he has weaknesses. One of the main issues he struggles with is precision. Precision is different from general accuracy. To be accurate is to get the ball to the area of the wide receiver. To be precise is to drop the ball directly into the wide receiver’s hands. Rudolph has struggled with this and is hindered by his tendency to both under and overthrow receivers. It’s not as prevalent of an issue as other quarterbacks, but it certainly is a problem that must be addressed at the next level. Aside from his lack of touch passes, Rudolph also struggles with injuries. In 2015, Rudolph dealt with a lingering foot injury. Then in 2016, as I mentioned earlier, he broke his rib but was able to play through it. This year, Rudolph was forced to sit out the Senior Bowl with another foot injury, this time it was a left foot sprain. 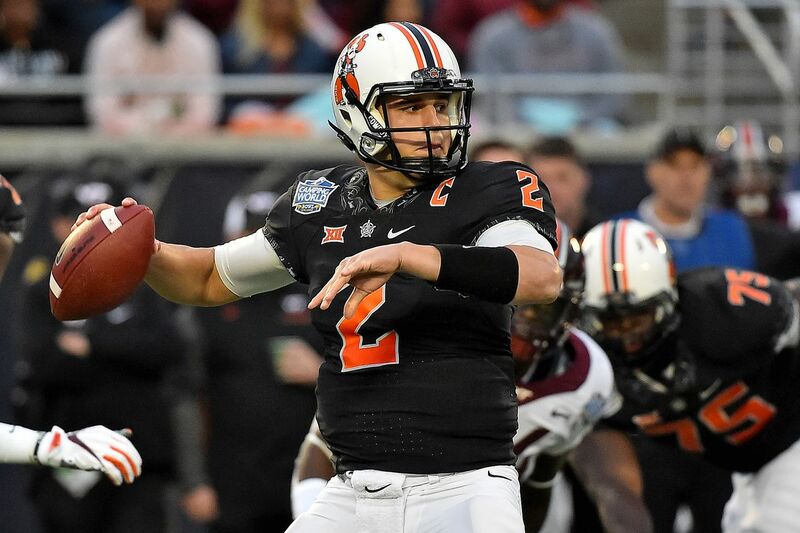 Mason Rudolph is one of the best quarterbacks in this year’s NFL Draft. Although he played in a spread offense system at Oklahoma State, Rudolph has the qualities and intelligence to convert to a pro-style offense easily. Rudolph can immediately start for a quarterback-needy team in 2018. All signs, however, point to him as a second-round quarterback, meaning teams that would want to start him immediately would pass on him in the first round. This opens up the opportunity for teams anticipating a change at quarterback to make a move. This is why I think Mason Rudolph will be this year’s Jimmy Garoppolo. The Ravens and Patriots are prime candidates to make a move for Rudolph in the second round, and I believe both teams are interested in this scenario. After thoroughly reviewing Mason Rudolph, I rated him as the fourth-best quarterback in the 2018 NFL Draft. With a grade of 7.9/10.0, Rudolph stands behind Baker Mayfield (8.9), Sam Darnold (8.6), and Josh Rosen (8.4). Rudolph is the ideal quarterback to train and develop behind Joe Flacco. If the Ravens do draft Rudolph in the second round, which is the best pick for his value, Baltimore will have a plan in case the unthinkable happens. Right now, if Joe Flacco is forced out of football early, Ryan Mallet would become the starter. With no future plan behind Flacco, the Ravens could easily fall back into quarterback limbo, harkening back to the dark days of Kyle Boller. Adding Mason Rudolph to the roster would prevent this, and at a second round cost, Rudolph is well worth it.